My guidebook DOING DISNEY! has been published by Theme Park Press! 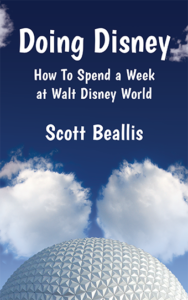 In 2013, I published a Disney World guidebook. The editor of Theme Park Press contacted me and asked if I’d be interested in seeing it published by his small press. Take a look at it if it interests you! This entry was posted in Uncategorized and tagged Disney, non-fiction, Personal, Theme Park Press on April 27, 2017 by Scott Dyson. I finished a couple of very good thrillers recently. First was Steven M. Moore’s GAIA AND THE GOLIATHS. This was the seventh Chen-and-Castilblanco mystery, and it deals with eco-terrorism and murder. It takes the reader from New York to Europe and also involves Moore’s Dutch Interpol agent Bastian van Coevorden on that end. It’s a well-constructed mystery that presents a balanced picture of the world of environmental activism along with several little nods to what’s going on in American politics today (the story is set a short time in the future, I believe). As I’ve come to expect from Steve Moore, this is a really interesting, thought-provoking read right from the beginning. Chen and Castilblanco are great characters, too. The second was Steve Richer’s THE POPE’S SUICIDE. Like Richer’s THE PRESIDENT KILLED HIS WIFE, this takes an unlikely crime involving a world leader and turns it around this way and that way. There are many layers of intrigue going on here, and I found it to be a can’t-put-it-down type of book. When the Pope is found hanging in his shower, suicide is the apparent cause. But of course it can’t be that simple, not to mention the complications that a Pope’s suicide would cause for the Catholic Church. Detective Donny Beecher is going through a rough time of his own, marriage falling apart and teen daughter rebelling and getting into some things that Dad wouldn’t approve of. And he’s assigned as the lead detective for the investigation. Solid plotting and writing make this a top notch read. Now I have to go read THE KENNEDY SECRET. So there you have it — three good solid books by indie authors. Check them out! This entry was posted in Uncategorized and tagged book review, horror, reading, Steve Richer, Steven M. Moore, thriller, William Malmborg on April 5, 2017 by Scott Dyson.